After Palos Verdes completed an undefeated Bay League season with a win against Peninsula, Mira Costa and Redondo squared off with playoff implications on the line. Mira Costa (6-4, 4-2) shut out host Redondo 21-0 to claim second place in the league. 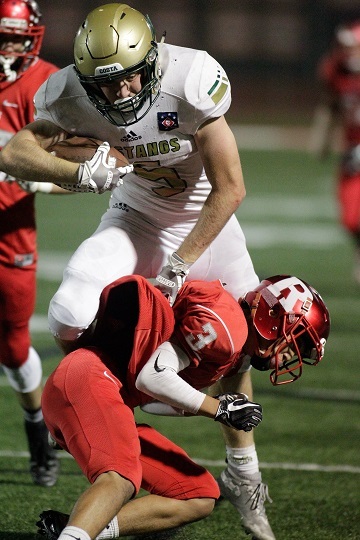 The Mustangs were led by running back Koda Thormodsgaard who ran for 80 yards and one touchdown but it was Mira Costa’s defense that made the difference, recording five interceptions in the game with four coming in the first half. Quarterback Nick Carpino was 12 of 25 passing for 140 yards and a touchdown and backup signal caller Reed Vabrey ran for a 3-yard touchdown. Redondo (4-6, 2-3) was led by running back Demarcus Johnson, who rushed for 142 yards on 14 carries. Redondo will travel to face top-seeded Corona del Mar in the first round of the Division 4 playoffs on Friday at 7 p.m.
Mira Costa will host Long Beach Wilson in Division 6 and in Division 5, Palos Verdes hosts Harvard-Westlake and Ocean League champion Lawndale, who earned the No. 3 seed, hosts Dos Pueblos. In Division 9, Pioneer champion North Torrance hosts Orange and West Torrance plays at Garden Grove. In Division 11, Peninsula hosts Ontario Christian while Hawthorne plays at Prep co-champion Rio Hondo Prep. In Division 13, Camino Real champion Bishop Montgomery hosts Garey and fourth-seeded St. Bernard hosts California Military. For complete brackets, visit cifss.org.